1.1 How Does a Live Casino Work? 1.2 What Games Can I Play in a Live Casino? Thanks to the advancement of technology, we are able to have many things today that were hard to imagine ten or twenty years ago. Live casinos, featuring actual live table games, dealt by flesh and blood dealers, and available to us on our computer screens are one such invention. These days, there are more and more people who enjoy live casinos and spend time playing live games instead of electronic ones. Some do it because they feel live games are fairer, others simply enjoy the social aspect of it all, and third love the whole brick-and-mortar casino vibe. Whatever the reason, if you belong to this group of players, this page brings you an overview of the most recommended live casinos for New Zealand players. Those new to live casinos as well as many who had an opportunity to try this new concept are often confused as to how the whole thing works. Things aren’t all that complex as they may seem at a first glance as new technologies and fast internet speeds have made many things possible. A live casino is exactly what the name suggests – a casino where live, real dealers, deal and supervise casino games using real cards, roulette wheels, dice, etc. Modern streaming technologies are used to transmit the video of the dealer over the internet and bring it to your home. In some cases, these streams originate from actual casinos, while more often different game providers set up specialized studios for this purpose. Players’ bets and decisions are recorded electronically and synchronized with the results of the hand, roulette spin, or a roll of the dice. This happens automatically through the use of special software and players are immediately notified about whether they won or lost, just like in a real casino. If you win, the money is usually added to your account immediately and you can cash it out or use it to place new bets. What Games Can I Play in a Live Casino? These days, players can play almost all games they can find in brick and mortar casinos at online live casinos as well. These are some of the most popular choices. Roulette is one of the absolute kings of casino table games, roulette was one of the first games to be offered at live casinos. The initial success gave game developers wind in the back, so they kept coming up with new ideas to spice things up. These days, apart from the usual variations, such as European, French, and American, players can enjoy different varieties of live roulette tables. For example, there is Immersive Roulette, focused on the player’s experience or Dragonara Roulette, where you get to place bets together with people actually present on the casino floor. Another hugely popular casino game, Blackjack was quickly introduced to live casinos online. These days, players can find different varieties of blackjack dealt by live dealers and streamed straight to your homes, from classic and American blackjack to single deck and many other types. Traditionally a game reserved for high rollers, baccarat is another game that found great success across various live casinos. Since this is a fairly simple game in its nature, developers tried to give it a new dimension by making the whole feeling more similar to actual casino experience. This is visible in variations such as Baccarat Squeeze, which brings one of the most exciting features of the land-based game to the virtual world. There are many casino poker variations where players are pitched against the house instead of each other. Many of these are found at virtual live casinos as well, including Caribbean Stud, Casino Hold’em, Pai Gow, and Tri Card Poker. As the appeal of live casinos increased so did the number of companies offering their services in this particular sectors. Today, we have a few names that are absolute leaders in the world of virtual live casinos. With live dealer studios in Malta, Georgia, and Latvia, more than 300 individual tables, and over 3,000 employed dealers, Evolution Gaming is easily the number one company when it comes to live dealer games. Specialized in providing the ultimate live casino experience, Evolution Gaming has a number of popular and less popular table games in their portfolio, many of which have also been fully optimized for mobile play as well. Net Entertainment, better known as NetEnt, is a Swedish company with a pristine reputation in the world of online gambling. It comes as no surprise they were quick to become involved with the live dealer casino industry as soon as they realized the potential behind it. 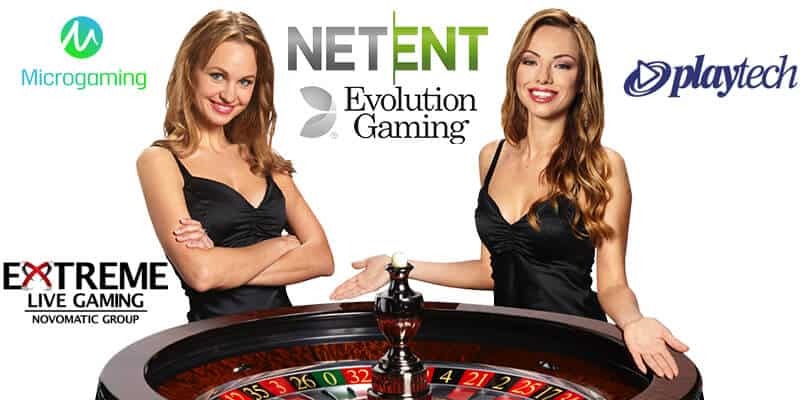 Today, NetEnt powers many live casinos on the internet and although their offering isn’t as strong as that of Evolution Gaming, they still manage to provide a top quality, life-like gaming experience. With live dealer studios situated in London, Extreme Live Gaming is one of the up-and-coming companies in the industry. There is an increasing number of casinos offering their live dealer tables, which stand out thanks to modern graphics and a powerful, highly captivating overall design.